An award-winning electronic concept album about the future of mankind, based on a short novel written by Duilio Chiarle. This is the 5th studio album of TWM (The Wimshurst's Machine) and one more novel (written by the award-winning bandmember Duilio Chiarle, decorated also at the Order of the Italian Republic for the high value of his writings) posed in music. If you don't know yet, The Wimshurst’s Machine is an award-winning 8-members italian chillout orchestra who play warm, environmental music. The Wimshurst’s Machine seamlessly cross from chillout to rock and can leap world borders landing in the Airport at runway progressive electronica. Their music is ideal for big-screen productions. The Wimshurst’s Machine is a project born by the music passion of each component and a mad idea, developed between friends and colleagues with little time to play together “in person”. Thanks to modern softwares and computers (as Propellerhead Reason, Apple Garage Band, Symphonic Orchestra, Sound Studio Pro and Apple Soundtrack), it has become possible to play together even when living apart, recording each track separated from the other bandmembers with modern “home made studios”. This Wimshurst’s Machine’s first album (A traveller who didn’t ask for glory) reached #2 Top downloaded Electronic album and #26 Overall on the iTunes italian online store on January 12 and 13, 2005! 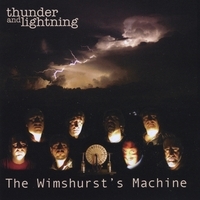 The Wimshurst's Machine has released several albums: A traveller who didn't ask for glory (2004), The Alchemist (2005), Time Traveller (double album, 2007), Secret Gardens (2009), Thunder and Lightning (2010). The band also released several collections but we rememind you of Freedom Lights (2006) and Aquarius (the best of TWM), with the best of their albums between 2004 to 2009 (out in 2010). TWM also scored several movie, documentary and theatrical play soundtracks but we remind you that "Return to Freedom" (also known as "Freedom Calls" in a different mix) was featured as main titles for the british movie "The Quiet Assassin" in 2006 (directed by Alex Hardcastle). This new Album from The Wimshurt's Machine is a highly polished, and in terms of genre `varied` which adds many elements of surprise as well as interest throughout the listen – which will have you hooked from track one! `Thunder & Lighting` ...is huge value too with 23 tracks of very well produced works. Fans of TWM will love this new Album, but I also think those new to the band will admire the variety as well as the musicality these guys generate. Highly recommended!